Sorry but this item for UK delivery only. 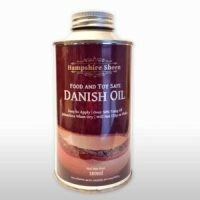 Hampshire Sheen’s Danish Oil is food safe and compliant to EN71 toy safe when dry. Thinner, more penetrating and less smelly that other Danish Oils, our product contains only pure Tung Oil and no artificial varnish, resins or other vegetable oils. The solvent used to aid drying is a dearomatized white spirit, which is less irritating to skin and lower in odor than traditional white spirit, and is completely biodegradable. Easy to apply; more than 50% Tung Oil; Food and Toy Safe (and odorless) when dry; Deeply penetrating and protecting: Will not chip, flake or peel; Naturally water resistant. Supplied in 500ml lacquered tin cone bottles and double sealed. This product may not be compliant with food and toy safe regulations outside the EU. Related links to "danish oil"
Customer evaluation for "danish oil"